At the Russian capital’s best open-air cinemas, viewers can spend time in a pleasant outdoor setting and watch original versions of films from all over the world. Pioneer is the first and the biggest outdoor cinema in Russia, seating over 350 people. It is located in central Moscow, in the city’s best-known park. Pioneer specializes in art-house films and movies first shown at various film festivals. Most are shown in their original versions with Russian subtitles. Its August program features the biopic Pelé: Birth of a Legend and Nicolas Winding Refn’s thriller The Neon Demon. The cinema is built as an amphitheater, and viewers are provided with cushions and warm blankets. There are also umbrellas and raincoats in the event of rain. The cinema also has a café. 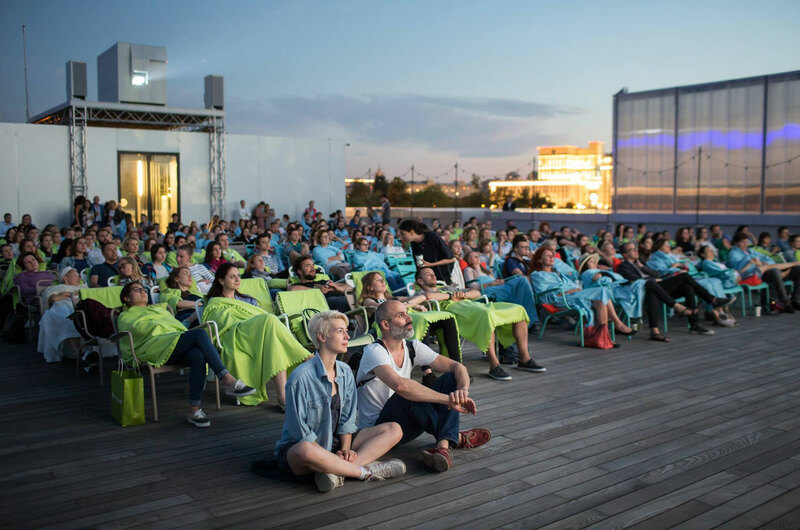 This summer, the rooftop of the Garage Museum of Contemporary Art, which is also located in Gorky Park, has for the first time been converted into an open-air cinema. As part of its Garage Screen program, viewers can enjoy art-related feature and documentary films from all over the world. The upcoming schedule features Hermann Vaske’s Arteholic and Crystal Moselle’s The Wolfpack. The museum has a restaurant with a summer veranda. The cinema is located in the park of the same name outside the modern art division of the Tretyakov Gallery, on the bank of the River Moskva. On a cozy veranda, it holds advance screenings of movies that have taken part in various international film festivals as well as animation films. Its program for August features Paddy Considine’s Tyrannosaur and Matt Ross’s drama Captain Fantastic. This outdoor cinema is located in one of the coziest small parks in central Moscow. Films are projected onto an inflatable screen set up on a lawn, with the sound coming through headphones. The program includes festival hits, animation films and shorts. In August, viewers will be offered Woody Allen’s Irrational Man and Dan Gilroy’s Nightcrawler. The price of the ticket includes a blanket and a padded stool. There are several restaurants inside the garden as well as street food stalls, so viewers can have dinner while watching a film. This open-air cinema and lecture theater is located inside the Soviet-era exhibition center, famous for its Stalinist architecture. The fact that the theater has a roof makes it possible to use it for film screenings and lectures every day throughout the warm season irrespective of the weather. The program consists of gala premiers, film festivals, seasons devoted to specific film-makers or themes. This summer, as part of its Cannes Weeks program, the cinema screens films that were shown at the 69th Cannes Film Festival: Pedro Almodóvar’s Julieta and Woody Allen’s Café Society. This outdoor cinema in Sokolniki Park is situated near the Big Rose Garden. Just as in Gorky Park, the cinema provides visitors with free cushions, blankets and raincoats, and there is a café and a kiosk nearby. Throughout the season (which lasts till October), Pioneer at Sokolniki runs the French Holiday festival, with a new French film opening every week.